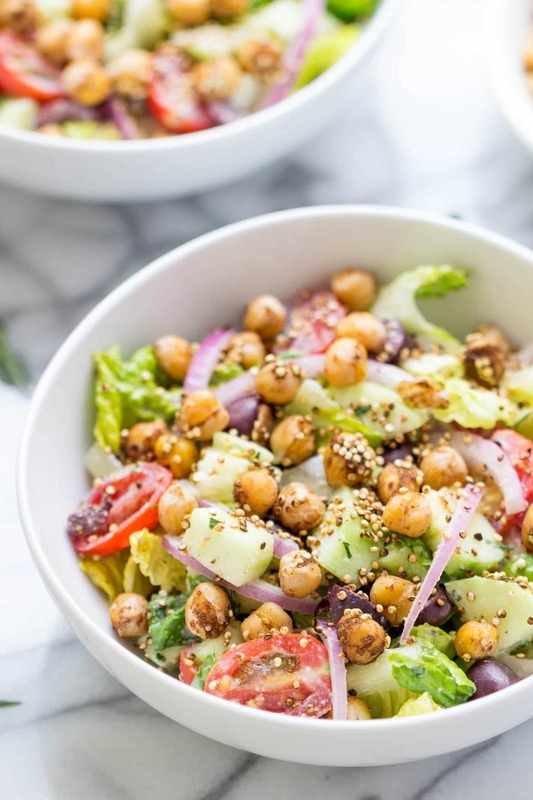 There's nothing more refreshing that a crisp, cool salad on a hot summer day! We've been having a bit of a heat wave around here, so all I've been finding myself craving for lunch and dinner is big salads. 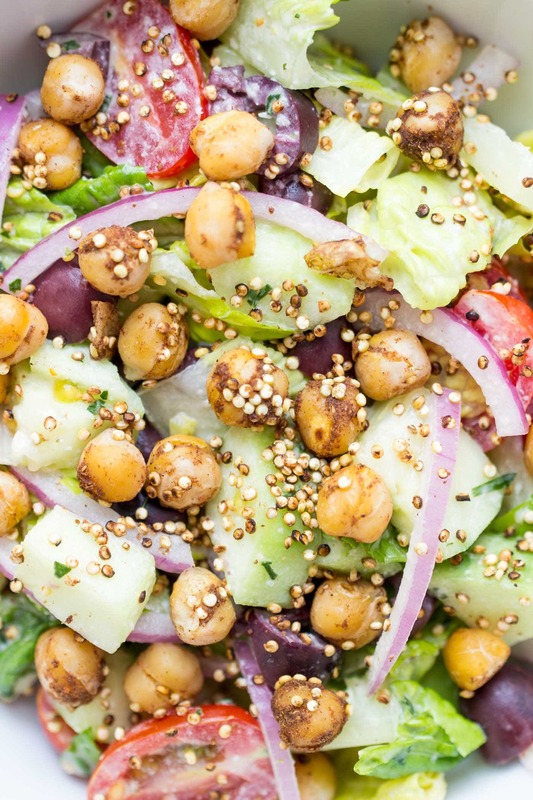 With temperatures creeping up to the 90s, this vegan chopped salad was a total lifesaver. 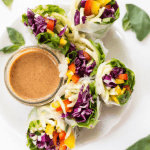 It's filled to the brim with fresh veggies, has the dreamiest creamy dressing and it's packed with plant-based protein. 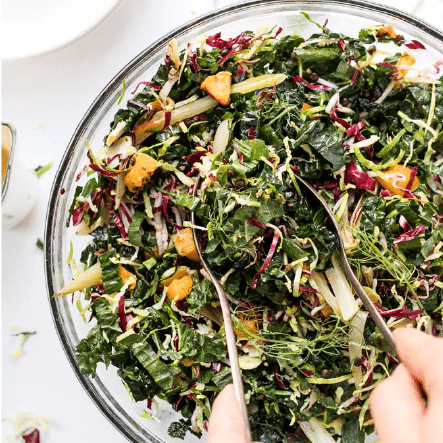 I'm so excited to share this salad recipe with you today because it's actually from my friend Andie Mitchell's brand new cookbook, Eating in the Middle. You might know Andie for her New York Times best selling memoir, “It Was Me All Along“. 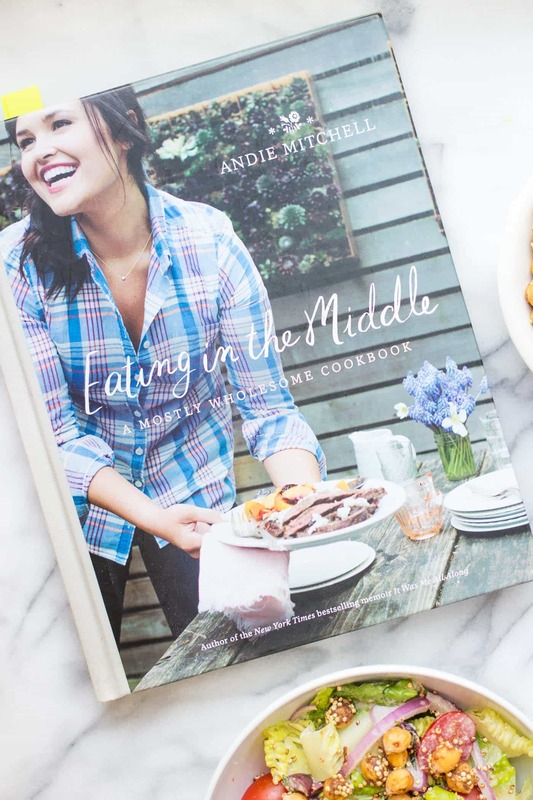 It's an emotional, through-provoking and beautiful book about Andie's life and her relationship with food. She actually lost 135 pounds and has been able to keep it off! I'm grateful to call Andie a friend: she's warm, caring and has an infectious laugh. And she's a genius in the kitchen and is amazing at coaxing out intense flavor in dishes, yet still keeping them simple. And I love her approach: mostly wholesome. This cookbook has something for everyone: easy breakfasts, light salads, simple dinners and decadent desserts. As I was flipping through the recipes, this chopped salad immediately caught my eye. 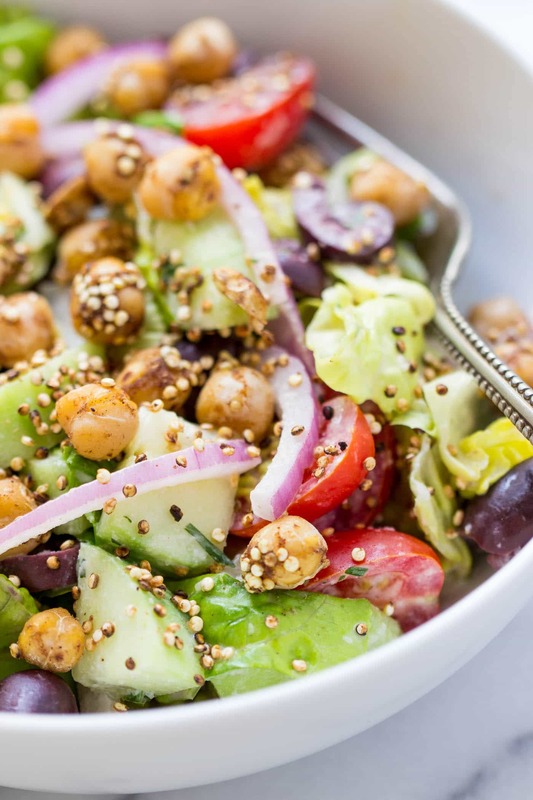 If not for the salad itself, the tarragon-tahini dressing and spiced chickpeas made it clear. This salad? You alllll need it! This was one of the best salads I have in a long time! The combination of vegetables was amazing: crunchy cucumbers, crisp romaine, juice tomatoes, salty olives and spicy onions. And then that tarragon tahini dressing? Oh my gosh, so good! The chickpeas were also a star of the show. I loved the way she marinated them in a zip lock bag and loved that they were slightly warm. The spices she used on them were unexpected, yet totally awesome at the same time. 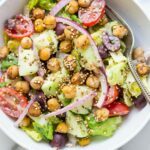 I would have never in a million years thought to combine cardamom, allspice and cayenne with a Greek inspired salad. I'm telling you guys, this girl knows what she's doing! 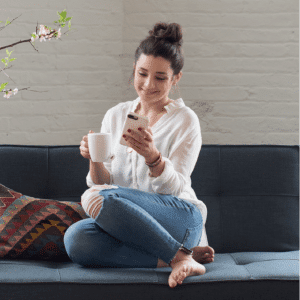 I highly recommend that you check out her cookbook – it's loaded with recipes for all tastebuds and may of them can be adapted to a variety of food allergies. You're going to love it! What's your go-to summer meal? 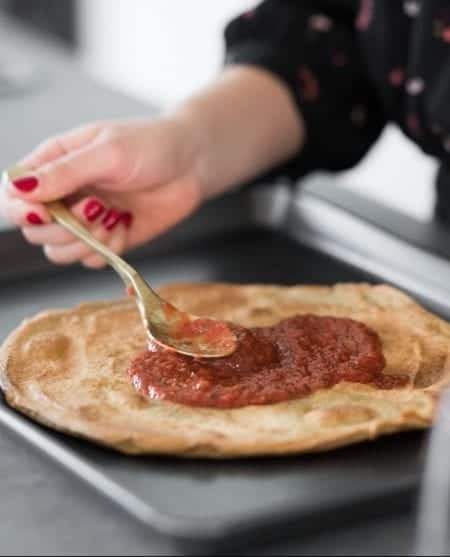 I'm looking for recipes to test out over the next few months and would love to hear what your favorites are! Let me know in the comments below and make sure to tag @simplyquinoa and @andiemitchell on Instagram if you end up giving this recipe a try! 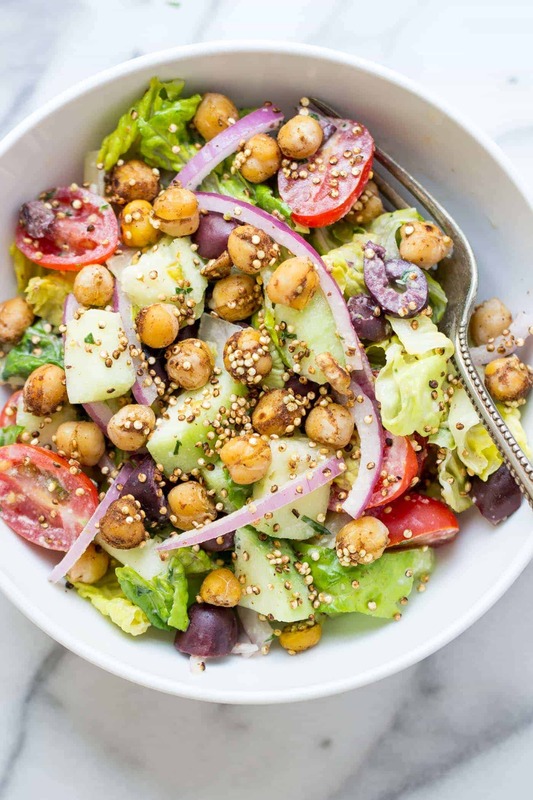 For the dressing, in a small bowl, whisk together the tahini, lemon juice and 2 tablespoons of water. Whisk in garlic, tarragon and salt. 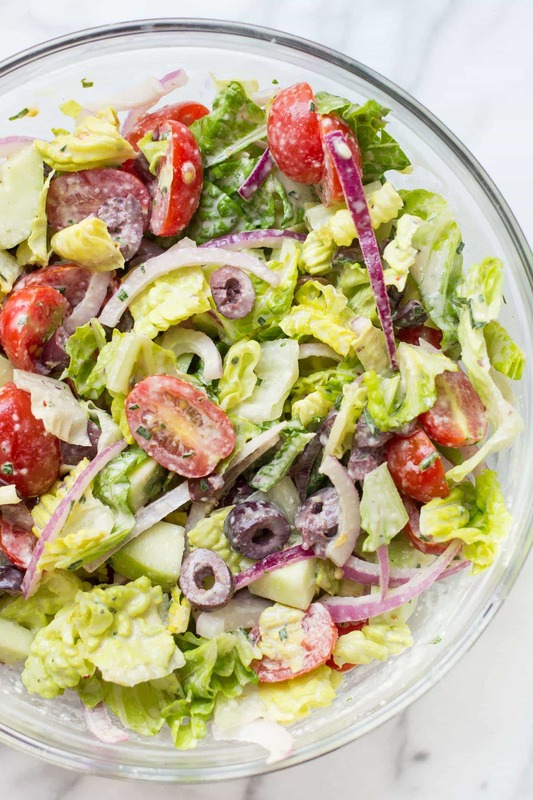 For the salad, in a large bowl, toss together the romaine, cucumber, tomatoes, olives and onion. Add dressing and toss to coat. 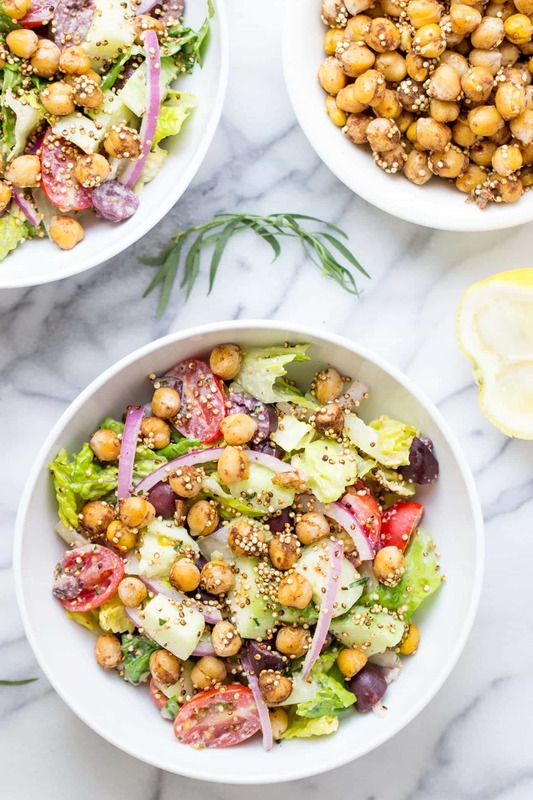 Serve into bowls and top with warm spiced chickpeas. Whisk together the spices in a small bowl. Pat the chickpeas dry with a paper towel and remove and skins that may have fallen off. Put them in a large resealable plastic bag with 1 teaspoon of oil and shake until coated. Add in spice mixture and shake again. In a 12-inch nonstick skillet (I have a ceramic one and LOVE it), heat the remaining oil over medium-high heat. Add the chickpeas and quinoa, and saute, shaking the pan occasionally, until they are browned and crispy. 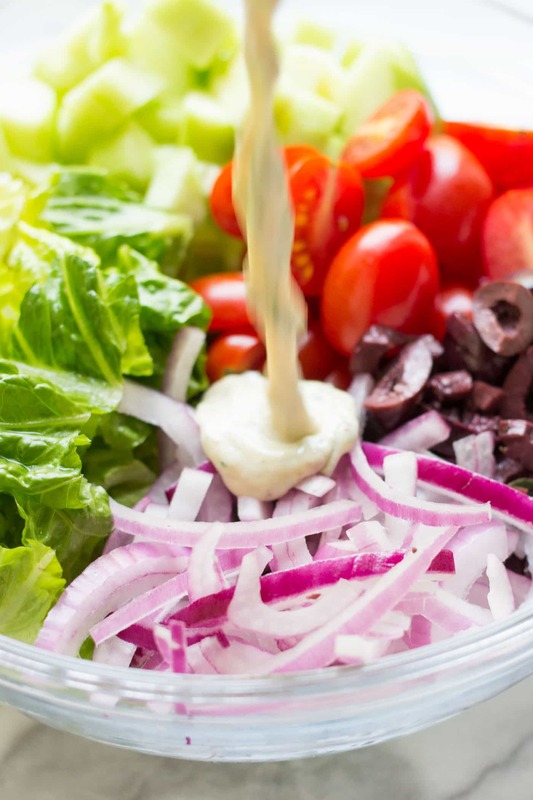 Serve on top of salad and enjoy! 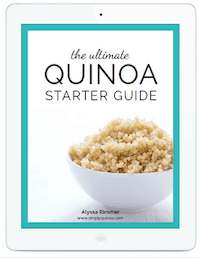 Surely the quinoa in thie recipe is not uncooked? 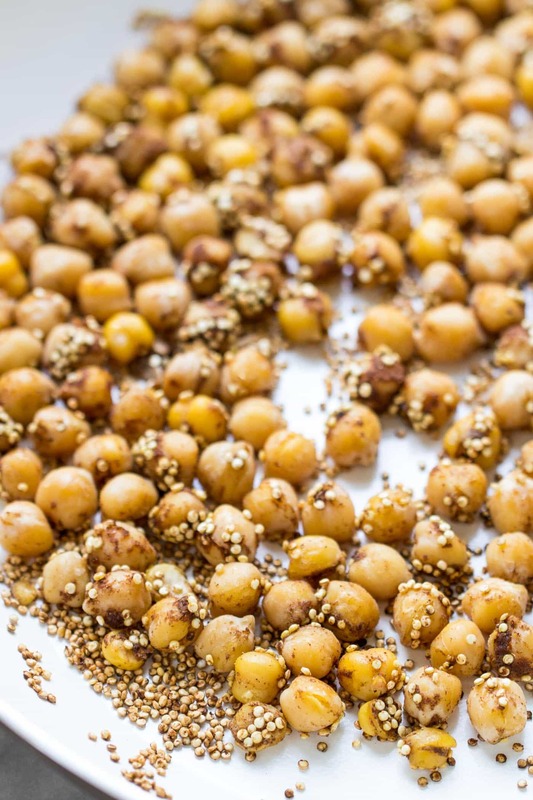 Recipe indicates that the chickpeas and quinoa were added to the frying pan. I’d like to make this recipe but not sure about the quinoa. 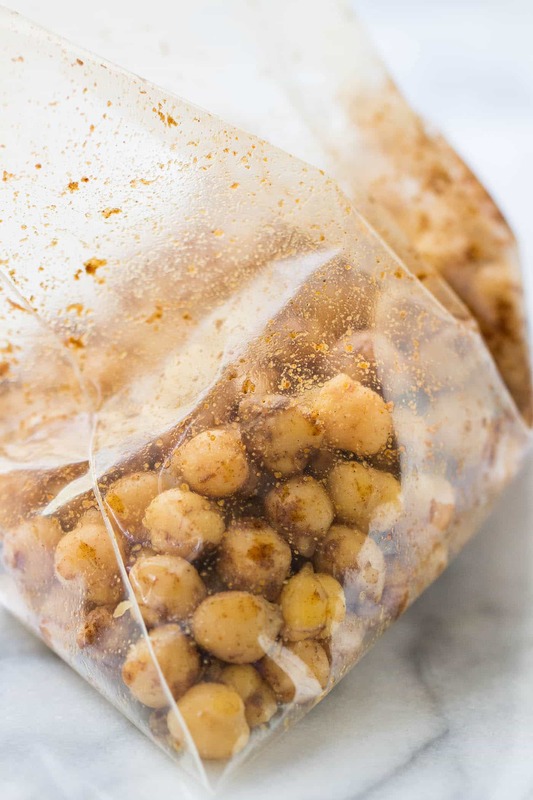 How long do you marinate the Chickpeas for before cooking? I just tossed them quickly, but you could certainly let them marinate to add even more flavor! Could you use other greens like kale and Swiss chard or would the salad dressing be too strong for them?